Covered by premium quality braided nylon jacket. Cables are durable enough to withstand heavy usage, but still in great performance. The tangle-free nylon braided cable with aluminum connector which is more durable, more flexible and sturdier than the standard cables with 5000+ bend lifespan. If you are not satisfied with our service or product, please contact us firstly. ICONIC will provide your best service. [USB3.0 (6.6Ft) Type C Cable]:The cable conforms to the USB Type-C specification version 1.1,standard 56kilohom and 22awg wire core identification resistor,ensures a safe charging 3Amps maximum current and data syncing speed up to max 5 Gbps.High-quality cable protect your devices and charging adapters from damage. [DURABLE NYLON BRAIDED CORD]:The cable has a durable nylon braided design with premium aluminum housing and sturdy nylon fiber cover adds premium durability to the cable,which makes it easily survive everyday usage and gives it a more stylish and elegant appearance that goes great with your expensive gadgets.The adherence to USB-C specifications ensures 2.4A~3.0A safe charging (Pullup resistor - 56K) and safety of your gadgets. [SUPERB BACKUP CHARGING]:Compatible with any charging adaptor, multiport charging station or power bank; the perfect substitute for your missing charging cable.charge your new MacBook,ChromeBook Pixel or other USB-C devices via any phone charger,portable charger or multi-port USB charger. 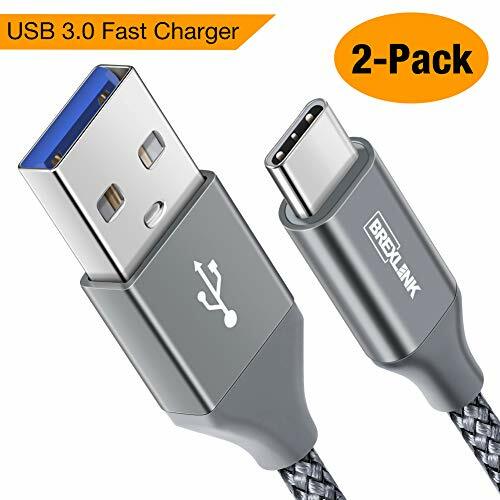 [USB C CABLE BROADCOMPATIBILITY]:Type C cable works well with Galaxy Note 8,Moto Z2 Play 2017,Samsung Galaxy S8,S8 plus,LG V30 Charger,Nintendo Switch,Google Pixel,Pixle XL,LG G5 G6 V20 V30,OnePlus 2,Nexus 5X 6P,Moto z,Moto g5,OnePlus 3,OnePlus 3T,HTC10,Huawei P9 Plus,New Nokia N1 tablet, ChromeBook Google Pixel,Asus Zen AiO,Lenovo Zuk Z1,HP Pavilion X2, ASUS ZenPad S 8.0,and other USB 3.0 Type-C cable devices. [WHAT YOU GET]:ICONIC USB Type C Cable (1pack-3.0-6.6Ft).???? ?Unconditional LIFETIME WARRANTY,ensures the long-time enjoyment of your purchase.If you are not satisfied with our service or product, please contact us firstly.